The seat of Webb County, Laredo is located on the Mexican-American border, directly across from Nuevo Laredo. For many years the international border between the two cities was in name only, as the two Laredos existed as one unified city. The roots of Jews in Laredo dates back to the city’s founding by possible crypto-Jews, yet the beginnings of the modern Jewish community can be found in the Jews who arrived with the railroad in the late 19th century. Though faced with immigration restrictions in the 1920s, Laredo’s Jewish community grew steadily throughout much of the 20th century. After disagreements between the Orthodox and Reform Jews in the city, they established two different congregations. Today, only one congregation remains as Laredo’s Jewish community has shrunk even while the city itself has thrived. The railroad solidified Laredo’s lasting importance for transportation to and from Mexico and contributed significantly to Laredo’s development. In 1881, Laredo was connected with Corpus Christi by the Texas Mexican Railroad and San Antonio by the International and Great Northern Railroad. As the first Texas border city south of Eagle Pass to have a railroad, Laredo prospered in the late 19th century, especially with the completion, in 1887, of a railroad connecting Nuevo Laredo with Mexico City. Laredo became a key stop in a long railroad network of Mexican-American economic exchange. The Jewish history of Laredo begins with the arrival of crypto-Jews, who, faced with the Spanish Inquisition, converted to Christianity but secretly maintained their identity as Jews. Luis de Carvajal, who was Jewish by birth but had converted to Christianity, became the governor in 1579 of Nuevo León, a large portion of what is today northern Mexico. Several of those in Carvajal’s initial exploring party were crypto-Jews who would go on to settle what is today Laredo. Some historians believe that while these early settlers had no outward Jewish identity, some of the customs passed down in their families originated in Jewish cultural practices which, over time, faded away into mere superstitions or cultural peculiarities. At the same time that the railroad came to Laredo, Jewish residents began arriving as well. In 1881, a newspaper noted that the Jews of Laredo and Nuevo Laredo were holding Rosh Hashanah services together at the home of Morris Hirsch. Hirsch, a German immigrant and resident of Nuevo Laredo, worked as a rancher and businessman, serving as vice president of the First State Bank. Like Hirsch, most of the Jews who arrived in Laredo in the late 19th century were of German or western-European descent. Jews in Laredo by 1880 included the German-native Jacob Cohn, who began as a clerk, but later opened an ice cream store, French merchant Adolph Kahn, and B. Rosenthal, a merchant from Poland. Jews quickly made a large impact in the city’s commercial sector, as an 1881 Laredo newspaper noted: “Rosh-Hashanah or the Jewish new year, commenced on Friday … All business houses of our Jewish citizens were closed … It gave a rather mournful appearance to our city to see most of the business houses closed…” Yom Kippur services conducted by “the Messrs. Rosenthal” were held in Nuevo Laredo in 1883 at the home of L. Marks, according to the Laredo Times. Thanks to the railroad, Laredo’s population grew significantly, from 3,521 people in 1880 to 13,429 by 1900. Among Laredo’s new residents were many Anglo-Americans, comprising Laredo’s first significant English-speaking population. Many Jews, too, arrived in Laredo in this era and became some of the city’s foremost civic and commercial leaders. Julius Wormser, a German immigrant, arrived in Laredo in 1890 from Corpus Christi and opened a dry good store with his brother, Ferdinand, who came in 1892. By 1910, they were both commission agents and by 1930 Julius had become a farmer. 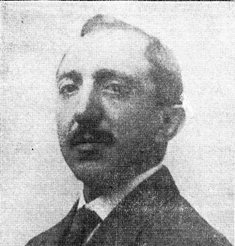 Until his death in 1922, Ferdinand was a key organizer of the Jewish community of Laredo. Other Jewish Laredoans at the turn of the century include German-native Adolf Saft who, by 1900, was involved in the banking and clothing industries, Charles Moser of France, who opened a popular saloon with his brother Joseph, and G.J. Levytanski of Poland, a prosperous jeweler. Levytanski was murdered in December, 1911 by two men who robbed his store. Leon Daiches took over Levytanski’s store and renamed it “El Daiches.” Daiches later served on the local school board and his years of service to Laredo have been commemorated in the city’s Leon Daiches Elementary School. The Alexanders, one of the most prominent Jewish families in Laredo, also arrived at the end of the 19th century. Confederate Army veteran Sam Alexander and his wife Rosa were German immigrants who arrived in Laredo from Victoria in the 1890s, though it was their sons who contributed heavily to Laredo’s growth and development. By 1896, their eldest son, Isaac, owned I. Alexander Clothing Company with his brothers Louis and William. Isaac, remembered long after his death as a “business genius” by a local newspaper, also served on the board of directors of the Laredo National Bank and entered into the agricultural field, pioneering the growth of onions and other vegetables in Laredo. The cultivation of onions, a new crop to Laredo’s surrounding farmlands, allowed for more irrigated farming around the city and helped invigorate the Laredo’s economy. Ben M. Alexander, too, was an important figure in Laredo for much of his life. After working at Laredo Mercantile Co. where his brother Louis was manager, Ben worked with the Mexican National Railroad and joined the Laredo National Bank in 1908, becoming its president in 1923. After Ben’s death in 1938, Louis succeeded him as bank president. The small size of the Jewish community in Laredo around the turn of the century did not mean that there was no religious observance in the city. Three days before Rosh Hashanah in 1899, the Laredo Times noted: “[The Jewish New Year] is generally observed with religious services, but on account of the small number of that denomination in Laredo the day will be quietly observed by them.” While the Jews may not have had organized services during the early 20th century, they displayed their Judaism by closing their stores on the High Holidays and by bringing in rabbis from surrounding cities for special occasions. Many San Antonio rabbis served the Jews of Laredo, officiating at various life cycle events. Sometime between 1900 and 1907, Laredo Jews established a Jewish cemetery in town. By 1913, about 60 Jews lived in Laredo. Ironically, it was the Mexican Revolution that led to organized Jewish life in Laredo. In 1916, the U.S. National Guard stationed troops in Laredo due to the bloody revolution being waged on and across the American border. That September, a Rabbi Gerstein arrived to organize a Young Men’s Hebrew Association for the Jewish soldiers stationed in the area and to make plans for High Holiday services in Laredo. Rabbi Robert Isaac Landman and Rabbi B.H. Birnbaum of New York arrived in Laredo later that month to help organize the YMHA and, according to the Laredo Times, not just Jewish guardsmen but “every Hebrew resident” of Laredo joined the Association. By October, the executive board of the YMHA included prominent local Jews Ferdinand Wormser as president and Solomon Freed as secretary. The YMHA put on social events that attracted both soldiers and local Jews, including a large gathering in 1916 that drew 200 people. Rabbi Birnbaum conducted Rosh Hashanah services in Red Men’s Hall in 1916, the first public High Holiday services ever held in Laredo, which drew much of the local Jewish community. Rabbi Birnbaum also organized regular Shabbat services. In 1918 and 1919, local Jews conducted Passover seders for the Jewish soldiers at the YMHA Hall. Due to the leadership of these New York-based rabbis, Laredo Jews established a congregation, B’nai Israel (“Children of Israel”), in 1916, with Ferdinand Wormser as president. By 1918, the Jews of Laredo were holding weekly Shabbat services, though the style of these services is unclear. The Laredo Times writes of High Holiday services at “Congregation B’nai Israel Hall” for Rosh Hashanah in 1919, though the Jews of Laredo almost certainly used rented facilities, such as the Western Union building or a room above a drug store. By 1919, the Jews of Laredo had formed a Ladies’ Jewish Aid Society, a cemetery association, and a Sunday school, organized by Albert Granoff, which was held in a Laredo public school. By the time the Jews of Laredo were establishing community institutions, a new wave of Jewish immigrants from Eastern Europe had started settling in the area. Although these Orthodox newcomers differed religiously from the Reform Jews who arrived in Laredo in the late 19th century, they followed similar occupational patterns. Albert Granoff of the Ukraine settled in Laredo in 1915 and opened a picture developing business before starting a successful furniture store. Granoff’s partner in the furniture business was Louis Franklin, a Lithuanian immigrant, who arrived in Laredo with his brother Moses in 1917. Louis spent time managing a factory in Mexico and the two brothers later became dry goods merchants, opening Franklin Brothers Store. Louis would go on to serve as a city councilman and mayor pro tem. Harry Ladabaum also came to Laredo in 1917, opening a textiles store. Russian immigrant Solomon Freed arrived in Laredo by 1914 and was later followed by his brothers Jack and Sam; the Freed brothers owned and operated Modern Furniture Company. Some of the other Russian immigrants to settle in Laredo during this era include: Max Schaffer, who owned a furniture business, Ben Lecht, a dry-goods merchant, cabinet maker Joe Torchin, shoe store owner Isadore Goodman, and Sol Rubenstein, who co-owned a dry goods store and later became city postmaster. The Immigration Act of 1924 severely limited the number of immigrants eligible to enter the Untied States from eastern and southern Europe. However, the act did not limit immigration from Latin America. If they were patient, many Eastern European Jews otherwise ineligible for visas were able to enter the United States after spending time in Mexico. Morris Greenblum arrived in Nuevo Laredo from Eastern Europe in 1925, followed by his family in 1927. While in Mexico, after working as a peddler, Greenblum collaborated with a neighbor and opened a number of furniture stores in Nuevo Laredo. By 1940, Greenblum, who had become a Mexican citizen (a rare feat for an immigrant), was able to come to the United States after bribing the necessary officials to pay for visas for himself and the rest of his family. Greenblum’s son, Irving “Pancho” Greenblum, grew up speaking Yiddish and Spanish and, after spending the first years of his life in Mexico, recalls how confused his teachers in Laredo were that, while he looked like an Anglo, he “couldn’t speak any English.” Irving later joined his father’s business, Mexico Furniture, which was located in Nuevo Laredo, crossing the border each day to get to work. Another example of the blending of Jewish and Mexican culture on the American border can be seen in the family of Israel Goldberg. Goldberg, a native of Lithuania, traveled from Europe to Tampico, arriving in Nuevo Laredo by 1929. He eventually became a Mexican citizen and immigrated to the United States in 1946. In 1947, Goldberg took over his brother Nathan’s Army and Navy Surplus store. Goldberg was advised to adopt a more common Mexican name to help his business, so Israel Goldberg became “Don Raul” Goldberg and his store became “Casa Raul.” In 2011, the store remained in business, run by Raul’s daughter Evelyn Selig and her two brothers, Moses and Henry Goldberg. Historically, there was little distinction between the Jews of Laredo and Nuevo Laredo. At times in the 20th century, more Jews may have lived on the Mexican side of the city than the American. The only kosher butcher in the area lived on the Mexican side. 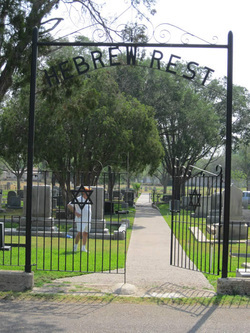 While no formal congregation existed in Nuevo Laredo, there is a small Jewish cemetery, though many Nuevo Laredoans utilize the larger Jewish cemetery on the American side. Even today, one of Congregation Agudas Achim’s Torah scrolls belongs to the Jewish community of Nuevo Laredo and about half of the synagogue’s members in the 20th century had roots in Mexico. Many Jews immigrating to the United States passed through Laredo because it was a logical and central border-crossing point. However, many immigrants chose to stay in Laredo because of the city’s economy, which flourished after the discovery of gas and oil nearby in the early 20th century. Also, many Jews stayed in Laredo because, while living in Nuevo Laredo and waiting to cross the border, they had become a part of Laredo’s Jewish community. The Jewish population of Nuevo Laredo numbered about 60 in the 1920s while Laredo had 93 Jews in 1919 and 128 in 1927. 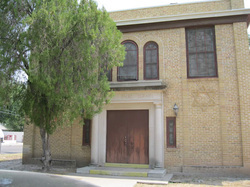 While B’nai Israel remained an active congregation, it contained two distinct groups: a larger group of German Reform Jews who had been in Laredo since the 19th century and were well assimilated, and the more recently arrived Orthodox contingent, which was smaller but growing. Despite their differences, the congregation began to discuss the possibility of constructing a house of worship. The Laredo Times in 1923 prematurely noted that a recent meeting of the congregation had “perfected” plans to construct a synagogue. However, the plans formulated at the meeting soon fell through, as the differences between the two segments of the congregation proved irreconcilable. In 1924 the congregation once again discussed the building of a synagogue though they avoided the question of religious ritual. The group eventually purchased a plot of land, though they had not yet made a decision about the religious affiliation of the congregation. In a tenuous sign of unity, the two groups collaborated for High Holiday services in the 1920s, renting the same building though holding separate services. The Orthodox group held services first, followed by the Reform group. However, according to Albert Granoff, the collaboration drew the groups further apart, as the Orthodox group was intolerant of Reform practices while the Orthodox customs were misunderstood by the Reform congregants. One year in the late 1920s, the Reform group brought down student rabbi Aaron Lefkowitz from Hebrew Union College in Cincinnati and held separate services in the American Legion Hall. Laredo’s Jewish community had split over religious lines. Despite this conflict over religious rituals, Laredo Jews worked together in B’nai B’rith, with members from both factions serving in leadership positions with the local chapter. Divided, the small Laredo Jewish community had a much harder time marshaling the resources to construct a synagogue. In 1936, the Jews of Laredo made one final attempt towards partnership for a new synagogue. The Orthodox group hoped to delay the question further in order to wait for more Eastern European immigrants to arrive in Laredo, thus creating an Orthodox majority among the city’s Jews. However, the Reform majority voted to split and build two facilities. A committee divided the assets of the congregation, with the lot they had earlier purchased remaining in the hands of the Reform contingent, which retained the name B’nai Israel, and a majority of the collected funds going to the Orthodox group. Under the leadership of Granoff and Daiches, B’nai Israel began fundraising in order to build a temple. Many local Gentiles donated funds towards the construction of the city’s first synagogue. In the midst of construction, which began in 1938, the Laredo Times wrote that the new temple “fills a long felt need for a church for the large Jewish population of the city, and is another step forward in the building of a bigger Laredo.” The congregation, which numbered around 30 or 35 families, dedicated the temple in September, 1939 in memory of Ben Alexander, a leader of the Jewish community who had passed away in 1938. Student Rabbi Julian Fleig presided over the dedication ceremonies which included addresses by Dr. Ephraim Frisch of San Antonio, Rabbi Sidney Wolf of Corpus Christi, a representative from each of Laredo’s churches, and, much to the consternation of some of B’nai Israel’s members, a delegate from Laredo’s orthodox group. B’nai Israel utilized the services of Rabbi Robert Bergman in 1945 and Rabbi Morris Clark became the full time rabbi in 1950 and began leading weekly Friday night services. Around the time Agudas Achim acquired a synagogue, the relationship between the two congregations seemed to improve. For example, both shared use of the Jewish cemetery and joined together to form a Sunday school, established in 1943. The school met for many years in the Community Center built alongside Temple B’nai Israel, though in 1969 Agudas Achim added school rooms to its facility and started its own religious school. Both congregations affiliated with national movements. 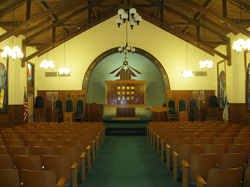 B’nai Israel joined the Union of American Hebrew Congregations by 1962, while Agudas Achim later affiliated with the United Synagogue of Conservative Judaism. Over the years, various rabbis have served Laredo’s congregations. B’nai Israel relied on visiting rabbis. Following Rabbi Clark’s tenure, Rabbi Jakob Petuchowski, a professor at HUC in Cincinnati, led high holiday services at B’nai Israel from 1956 until 1991. However, as the Reform Jews only observed one day of Rosh Hashanah, Rabbi Petuchowski attended services at Agudas Achim on the second day. Following Rabbi Petuchowski’s death in 1991 and until 2010, Rabbi Ezra Spicehandler, a professor at HUC, served B’nai Israel, on the High Holidays. Agudas Achim was able to employ a series of full-time rabbis in the 1950s and 60s. Later generations of Laredoan Jews remained active in commercial and civic life. From 1935 to 1960, Jennie Goodman, appointed by President Franklin Roosevelt, served as postmaster of Laredo. Joe Brand, the son-in-law of Leon Daiches, opened a men’s clothing store in Laredo in 1935 and served on the local school board. His daughter, Patsy Brand Sanditen, became the first female president of B’nai Israel’s board of directors around 1980. Albert Friedman arrived in Laredo in 1952 and opened a number of retail stores. Jews remained leaders of Laredo National Bank; Maurice Alexander served as Chairman of the Board while Max Mandel and Gary Jacobs served as president of the bank. Michael Landeck, a university professor, served as a city alderman. While in many other cities Jews in the late 20th century became professionals rather than merchants, today, most of Laredo’s Jews remain involved in the retail business. Many Jewish Laredoans, such as Pancho Greenblum, Evelyn Selig, and Linda Deutsch, continued in their family businesses. Deutsch runs Joe Brand, started by her father in 1935.With stores in both Laredo and McAllen, Joe Brand remains one of the few independently owned mall-based department stores still in business today. The Jewish community in Laredo peaked in size during the post-World War II era. According to population estimates, 420 Jews lived in Laredo in 1980. A majority of these Jews were affiliated with the Conservative Agudas Achim. After the 1950s, B’nai Israel never had more than 25 contributing members. Like many other smaller Southern cities, the Jewish population of Laredo is currently in decline as Jewish children raised there move away to larger cities in Texas and beyond. By 1995, B’nai Israel was down to three contributing members. In the early 2000s, the congregation decided to close its temple, holding High Holiday services for the next several years at the Laredo National Bank or a local hotel. By 2010, B’nai Israel decided to end this practice and formally dissolved after merger discussions with Agudas Achim were unsuccessful. Several of B’nai Israel’s former members have joined Agudas Achim. The Conservative synagogue’s membership, though shrinking, numbers 35 to 40 families. Services are held every Friday night and Saturday morning.